The Vauxhall Omega PowerSounder is indeed a very hot topic of conversation, covering both myths and legend, and hopefully, (whilst not a definitive guide), this may shed some light on a few things, and prevent the same old questions being asked on here. Powersounder – What is it? Back in the mid 1990`s, the insurance industry applied a new set of rules for vehicle security, and around 1996 (ish) legislation was passed to ensure that ALL new cars designated for the UK had to meet the new security criteria as laid out by the MIRRC at Thacham. Essentially, cars fell into two basic categories, Cat 1: an Alarm and Immobiliser, and Cat 2: an Immobiliser only – there are others, but irrelevant for now. The Cat 2 Immobiliser was now mandatory, but part of the criteria for Category 1 was that the Alarm system had to include some form of battery back up facility, so that the vehicle was still protected in the event of a main battery disconnection. Unlike other vehicle Alarm systems, the Sigma system as fitted to the Omega, only fell short of this particular requirement for Cat 1 status, and rather than designing a whole new system, an additional siren (or Powersounder) with its own internal battery was fitted to work alongside the existing alarm. The rechargeable batteries of the Powersounder are kept in a charged state due to them being connected across the terminals of the main vehicle battery. If the main battery is low in voltage, due to cold weather or lack of use, then it is not uncommon for a “beep” to be heard from the Powersounder whilst the starter motor is cranking. However, whilst a “beep” every once in a while is fine, a “beep” EVERY time you start the car is not. If it becomes more frequent, or the siren starts to sound more erratically, then it may be illustrating an underlying problem. One of the most common symptoms of an imminent Powersounder failure is that of battery drain on the main vehicle battery. If your Battery is continually going flat over a few days, then you need to identify the cause. The first thing to check is main vehicle battery condition and state of charge – Do not assume because the car starts easily that the battery is in good health. Its worth getting it checked professionally, and many battery centres will offer this service free of charge as it takes but a few minutes to perform a “drop test”. If the main Battery and associated charging circuits are ok, then the Powersounder may well be worth investigating next. Because the Powersounder is there to prevent some tea leaf removing the battery to disable the alarm system, it does also mean that you cannot simply disconnect the battery without the siren going off, unless you follow the correct procedure to disarm the Powersounder first. Reconnection of the Battery is straightforward, and not uncommon for a loud “chirp” when doing so. The Powersounder is located underneath the scuttle panel at the base of the windscreen and underneath the wiper arms on the drivers side. Removal takes around half an hour. 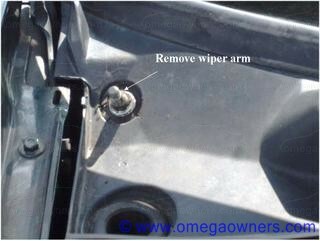 Remove the wiper arms using a 13mm socket. 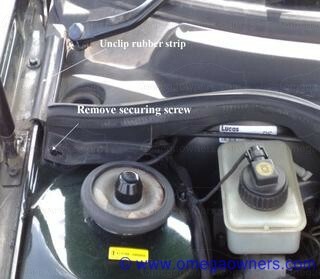 Remove the star shaped screw holding the plastic scuttle panel on the left hand side of the engine bay. Remove the rubber that runs across the front edge of the scuttle. Remove the clips holding the front part of the scuttle on the passenger side. Underneath the rubber at the bottom of the screen are some retaining clips that are released by twisting. The long part of the scuttle is clipped in place with around 5 clips, and the smaller section with 3 clips. Both sections can now be lifted out. Remove retaining screw on scuttle cover and unclip small rubber seal. 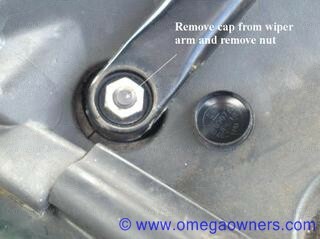 Prise off the cap on the wiper arm to reveal locking nut. 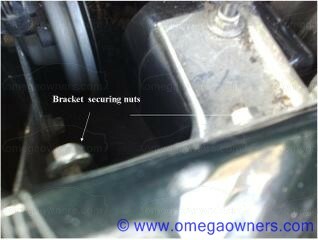 Remove locking nut and remove wiper arm noting the position of the arm on the spline. If the arm is tight to remove you may have to resort to using a small pair of pulley drawers and carefully remove the arm. Once you have got this far it is possible to lift the scuttle cover enough to see the power sounder and alarm horn. The power sounder is secured to a bracket which in turn is secured to the suspension post cover. 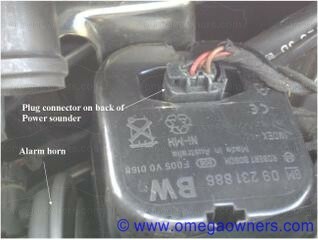 If the Powersounder plug connector is at the bottom of the unit, it may be easier to remove the bracket with the Powersounder still attatched. After removing the two nuts holding the bracket it should be now possible to tip the unit to reveal the connector. You can now unplug and remove the Powersounder. If you didn`t follow the correct battery removal procedure first, you will now be left with a siren going off for the next 5 minutes, but it will eventually stop. Refitting is simply the reverse of removal. So what causes the Powersounder to fail? 99.9% of the Powersounder problems are down to the internal rechargeable batteries. As with any other rechargeable battery, they have a finite life span, and do not last forever. In an ideal world, these small rechargeable batteries are kept fully charged due to their connection across a healthy main vehicle battery and will therefore give many years of reliable service. However, the reality is that due to the constant bad weather, low temperatures and price of fuel, many of us are making much shorter journeys these days, and leaving the vehicle parked up for long periods of time. This does means that our main vehicle battery is no longer in a healthy state of charge. This can also cause the internal “plates” of a battery to buckle and fail and not hold their charge. This also has a knock on effect to the small rechargeable batteries inside the Powersounder, as they too, are no longer kept fully charged. They do not take much to charge them back up again, but this is where the problems start. As the batteries go from low voltage to fully charged on a continuous cycle, they shrink and contract with low charge and swell and heat up with a rapid charge. This constant physical change causes the seams of the battery to fatigue and eventually rupture, and when it does, it leaks electrolyte and acid all over the internal circuitry, causing a major failure and in some instances, combustion – that’s “Fire” to you and me. The question that will undoubtedly be asked, will be, can it be repaired? and if it’s the internal batteries that have gone, can they be replaced? 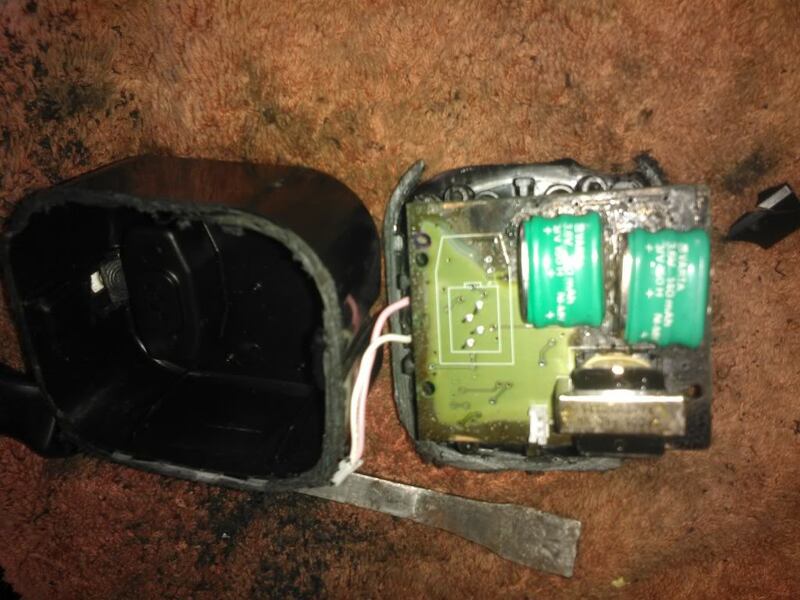 Well, all I can say is that, whilst replacement batteries are readily available from some high street electrical component stores, most of them floating about seem to be the poor quality China products we are being overloaded with, and I`m not so sure that they offer a reliable solution. That is of course, if the internals of your Powersounder are not completely corroded from the acid leakage. If the insides look corroded like this, then I`m afraid its dead. The only viable solution therefore is to buy a replacement Powersounder. Due to the problems that have been highlighted, it should be fairly obvious that a second hand one is out of the question, and I would also be very dubious about buying one from an internet auction site too. Unfortunately, they are not the cheapest item to buy from a Main Dealer, but this is the only place you should be looking. If it has been sat on the shelf for a while, it would not concern me in the slightest, as its only once the batteries have started to be charged and discharged that the life starts to deteriorate. What if I simply ignore it? As stated, it is not uncommon for the Powersounder to chirp, beep or sound every once in a while, or if the battery voltage is low. But if its happening very often, and it gets to a stage where you can start to “predict” that its going to make a noise, then its time to take drastic action. Do not put it off, because if you do, then the batteries may leak, and the Powersounder will become a dead short circuit across your Main Battery terminals, which will sadly end like this. Luckily this one was caught and extinguished quickly, but this fault has indeed claimed many members cars on here. Can I simply remove it? The Powersounder is not integral to the vehicles electronics, and the car will operate perfectly if it is removed. However, you need to be aware of some serious implications. As previously stated, part of the legislation was to ensure that the vehicles met the security standards as laid down by the MIRRC and that the level of Thatcham Category 1 was met. If you remove the Powersounder, then you car no longer meets the required standard for insurance. If you told your Insurance Company that the car is Thatcham Cat 1, or has the standard Alarm fitted, and they find out that the Powersounder has been removed, then not only may the Insurance policy be void, but they may also come after you for Insurance fraud in the event of a claim. 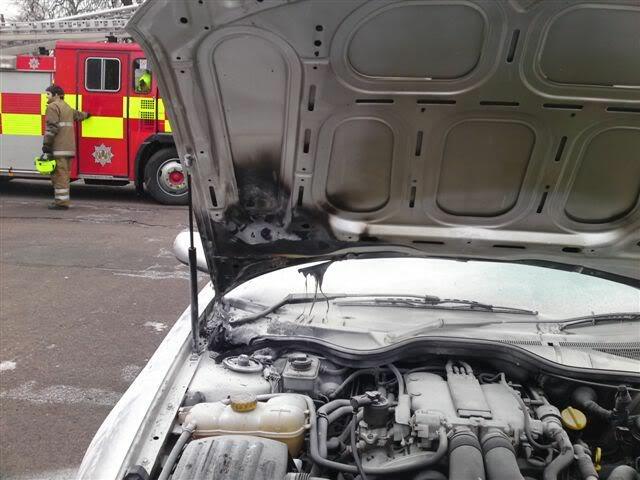 Big Brother does read forums such as this, and as an electronics expert who has been called upon for a few vehicle fires, I can assure you that looking for a Powersounder on an Omega is now amongst the checklist of items for quite a few Insurance Assessors out there. This is as a direct result of so many saying to the world that they can be removed. You may think so, but the Insurers disagree. There are always alternatives though, but they do come at a cost. It is indeed possible to remove and replace the entire Vauxhall Omega Alarm system with an approved aftermarket system, but the costs of this may not be considered viable against the cost of the vehicle itself, or of a genuine replacement Powersounder.